Yes - but this topic and discussion is for the new upcoming course, which uses fastai v1. @ashtonsix states above that he’s installed fastai v1. So please don’t use this topic for discussing the previous version of the course. I really appreciate such a easy to understand UI and useful service! I think the nvidia driver version here 296 is wrong, maybe typo? can you please let us know steps for getting fastai v1 version . @jm0077 Salamander includes both fastai 1.0 & 0.7. You can run both old & new course material. @ashtonsix your service is amazing. Thank you so much for this! @bartdegoede, @johnhartquist: thanks! It’s silly for students & scientists to repeat the same rituals thousands of times when it only takes one person to setup. I’m just amazed nobody from aws or gcp tried to make this stuff easier. can you use fastai v1 with jupyter notebook as well? or does it only work with jupyter lab? JupyterLab is just an IDE for working with notebooks, code and data. When you are using JupyterLab you would still be using your Jupyter notebooks in the usual way. am i doing something wrong here? thanks for your help! 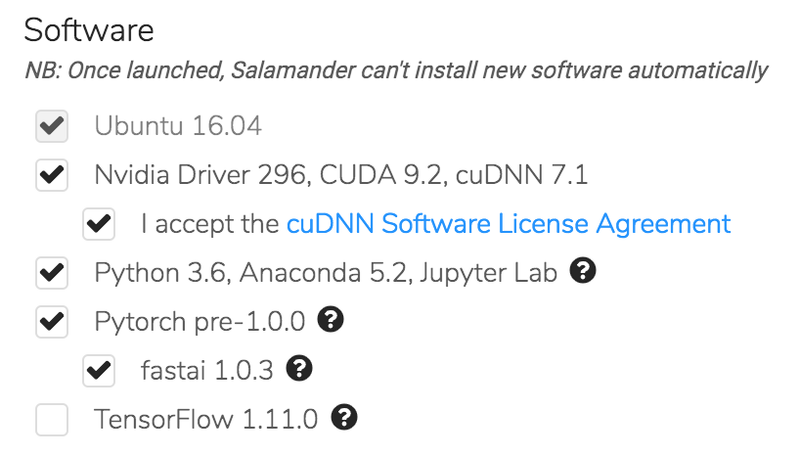 @Edward conda updates on Salamander have been broken for the last 3 days. I’m working on a fix right now. Once fixed, you’ll need to run “source activate fastai” before “conda update fastai” (no channel needed for updates). I also recommend creating a brand new Salamander server on Monday. Is there a running timer I can see how much time server has been running? In order to completely stop my server do I have to just log out or click ‘destroy’? How do I stop my server to halt the time usage but access it again later?